Please don’t tell the BVI Softball Association’s Juliette Penn Fast Pitch League defending champions Pirates that the Mailman doesn’t deliver on Sundays. Power Outage chased Pirates starter Nikos Penn in the first inning. When Allen “Woodrow” Smith came in and seemingly settled things down and they clawed their way back, pulling within 8-5, Khoy “Mailman” Frett delivered a two run home off Smith to put more pressure on them, before their defense collapsed on a force out at second. Power Outage added another three runs in the bottom of the fifth, en route to a 13-6 victory. 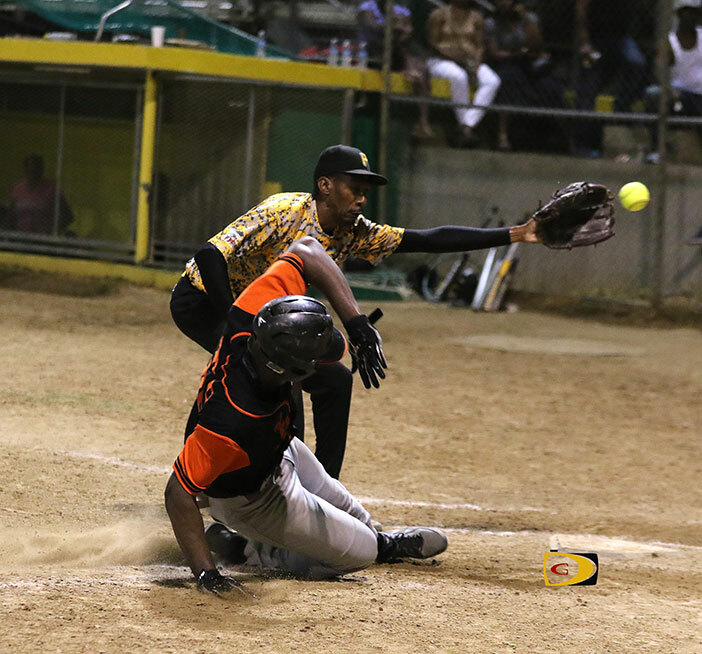 Power Outage’s manager Keno Gumbs said they know Smith is a great pitcher, so it was very important to start off the way we did because we were the home team, therefore, it was important because the Pirates are a great team. Game two is scheduled for Sunday and Smith said they have a simple task in trying to even the series. “All we have to do is to come, feel good and stay focused and we’ll be alright,” he said. Power Outage’s Jamarli James went 3-for-3 and had two runs batted in. Jeremy Penn had three hits in four at bats including a homer and two RBI’s. Khoy Frett finished 2-for-3, scored twice and had three runs batted in. Rico Penn, Kye Rymer and George Burrows each knocked in two runs for the Pirates. In women’s play, the Hawks pounded the West End Warriors, 14-1, to when their best of five series 3-1, earning the right to meet That’s Your Problem, for the title.